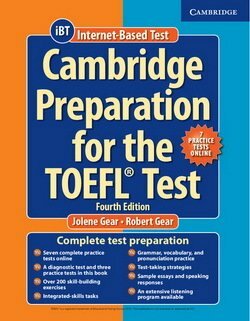 The Cambridge Preparation for the TOEFL Test, Fourth Edition, pomáhá studentùm pøipravit se na zkoušky TOEFL a nauèit se efektivnì komunikovat na akademickém poli. Vhodné pro výuku ve tøídì nebo individuální pøípravu. The Cambridge Preparation for the TOEFL Test, Fourth Edition, helps students master the language skills they need to succeed on the TOEFL iBT and communicate effectively in an academic setting. Using an integrated skills approach that mirrors the structure of the TOEFL iBT, this up-to-date text is ideal for classroom use and self-study. The book contains hundreds of skill-building exercises covering all of the question types in the exam and four practice tests. A supporting skills section is provided to improve grammar, vocabulary, pronunciation and study skills. The Online Practice Tests include the tests from the book plus three additional practice tests in an electronic format that simulates the online TOEFL iBT. This package also includes all 8 Audio CDs, allowing students to study at home. Každý nákup se u nás vyplatí! Za každý kus získáte bodù: 16 kreditních bodù!